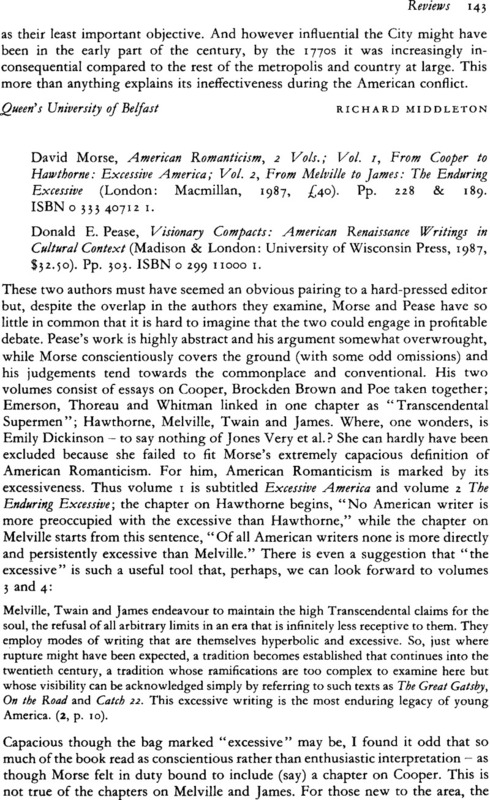 David Morse, American Romanticism, 2 Vols. ; Vol. 1, From Cooper to Hawthorne: Excessive America; Vol. 2, From Melville to James: The Enduring Excessive (London: Macmillan, 1987, £40). Pp. 228 & 189. ISBN 0 333 40712 1. - Donald E. Pease, Visionary Compacts: American Renaissance Writings in Cultural Context (Madison & London: University of Wisconsin Press, 1987, $32.50). Pp. 303. ISBN 0 299 11000 1.